Gallerite is an incredibly unique and highly interactive Responsive Joomla template for creative portfolios. Based on a responsive grid, packed up with lots of cool features and built on a powerful admin panel for build unlimited layout module positions, this can become the perfect portfolio template for you! 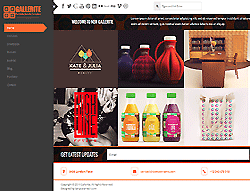 Gallerite is packed with essential features such as different post formats using K2 blog, excellent front-end portfolio gallery, quick build shortcodes using helix shortcode maker, blog sidebar area's, stylish moving left menu and a great design.